This week our challenges was "to create a card using any kind of polka dots & gingham ribbon". Not too difficult a challenge this week .... and one some of our CCEE members should enjoy esp considering some of them just love polka dots! I recently discovered the "Black Magic" technique and wanted to play with that this week ..... using my new acquired Fabulous Flowers Set from SU. This is a really easy technique to do. 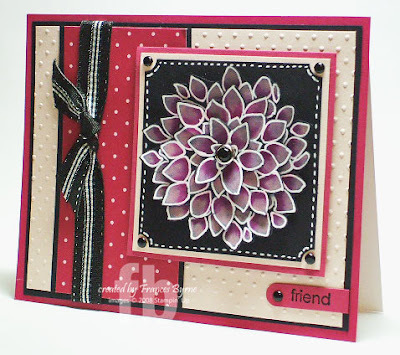 I stamped the flower out 3 times using white pigment ink onto black card and then allowed this to dry. I then too two different colored pink prismacolor pencils and colored in the flower petals. Once the flower was colored I outlined each petal using a white pen. I then cut out each flower ... to get 3 different layers and used my bone folder to give them a little shape before securing them together with a black jewel brad. Ok now to the challenge requirements ... I used my swiss dots cuttlebug embossing folder to add the dots to my blush blossom layer and also used the rose red DP that had polka dots. For my gingham ribbon ... yes it is there Cindy M ... check again LOL ... I layered it onto my black ribbon before tying it into a bow and adding it to my card. Phew no buzzer for me this week. Stunning Frances, love that flower and love your gingham and dots. Wowsers Hoots!!! That flower is STUNNING!! Love it!! Love all your dots and colors too!! Fabulous job!! Wowee, this is a stunning beauty! I so love the depth and color of your beautiful flower! Awesome job, Hootsie!